When I developed the new website, aIa was largely unconcerned with the design and layout of the website. It worked fine for the previous version, so I only improved a few select areas, such as navigation between games, results, theme and analytics. The update is aptly named "Quality of Life," as I have refactored and refreshed the entire website. There's virtually been no stone unturned. When you browse the updated website, it will feel like a breath of fresh air. With this update, I feel that I can say with confidence, that this is the best game jam website. A bold statement, so let's take a look at the list of changes. Icons and banners are now automatically optimized. I love organizing the gm(48). It's a fantastic community event, and I love to see what people create in just 48 hours. I have every intention to keep organizing the gm(48) for as long as there's interest from the community in participating. 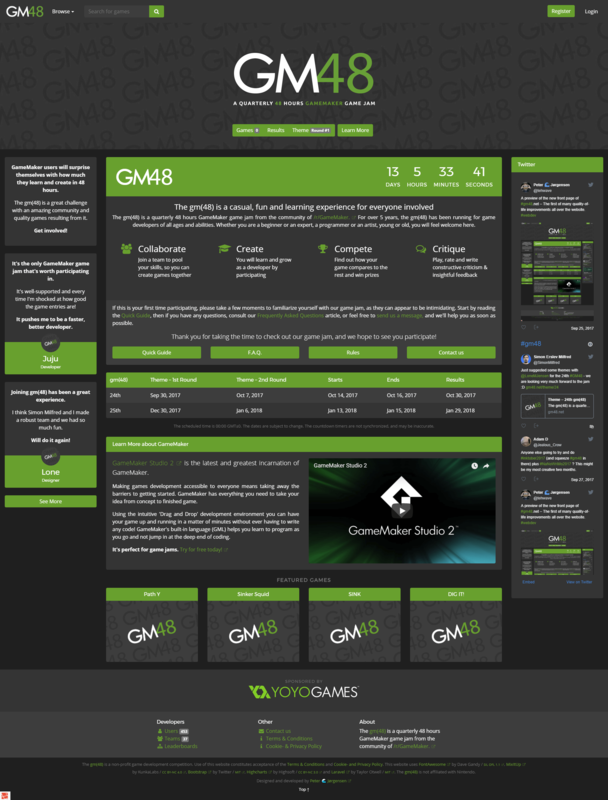 However, this is the last major update that I'll do for gm48.net. I still need to bring over some old data, such as results and feedback, and I will continue to maintain the website, but that's it in regards to the major development of the website. I'm in the process of writing a blog post about how I built the website, including a history lesson on how it came to be, as it's important for me to reflect on the progress over the years. Thanks to everyone who has helped building the website. It's been a long journey to get to this place, where I can say "it's finished," but we've arrived. Thank you. I have been thinking about how I can ensure, that I don't have to worry about the website's upkeep. As you can see on the Donation page, the website costs me $300 / year, excluding some additional costs, such as domain fees. In my experience, donations can cover 1/4 of a year's cost. While they are strongly appreciated, they don't cover the costs, and I feel bad asking for someone's hard-earned money, which is why I allow hiding the donation messages in Preferences. I hate intrusive monetisation. There must be a way to monetise, but advertisements are an eyesore and predatory in nature, and memberships means stripping away features and giving unfair benefits to those who pay. That means, that the monetisation must be unobtrusive to the user. Enter cryptocurrencies. There's recently been a lot of talk about cryptocurrency mining for websites. In essence, the browsing user shares some of their computer resources to mine cryptocurrency for the website. It's a new concept, largely untested, but I think that it warrants an experiment. Some websites has started mining without their users awareness or consent, and without throttling the performance demand it has on their computer. This is wrong. My plan is to a) inform the user about what, how and why there's mining, b) to make the mining heavily throttled, to the point of being idle at 95% of time per default setting, and c) let the user disable the mining. I think, that this will be informative, secure and productive for the users and the website. I'll have more details about this in a later post. Please let me know your initial thoughts on this subject.